Used in conjunction with either one of our trimmer racks this is a low cost answer to storage of rakes, shovels, brooms, etc. Simple bolt on installation will fit all existing trimmer racks. 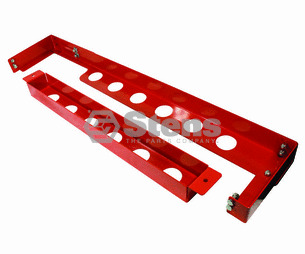 Adjustable width eases installation and includes assembly hardware.Handle holder protects handles and mounts out of the way on the trailer floor or trailer top rail.Holds five tools out of harm's way, yet easily accessible. Durable powder coat finish. Ask us about the Stens 051256 Hand Tool Storage Rack. Please no repair questions. Your Q&A may be posted to Jackssmallengines.com to help other shoppers, like you, with their purchasing decisions. Thank you.